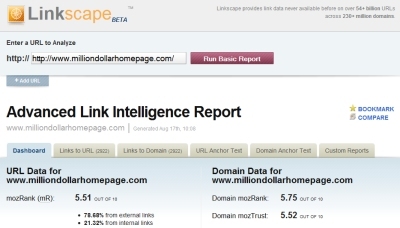 There are two pay-to-play link intelligence services – Linkscape from SEOMoz and Majestic SEO. Since I am a glutton for punishment I have used my own money to test these two pay services to compare them against the free information Yahoo Site Explorer. I selected 9 websites that I felt would represent most webmasters. I ran reports on these nine websites during the month of August 2009. It quickly became apparent that Yahoo Site Explorer, SEOMoz LinkScape & Majestic SEO do provide link intelligence but each is unique and has its own flavor. It is a little hard to compare them to each other since they each provide slightly different data points. Disclaimer – I personally know people at SEOMoz & Majestic. They are nice, smart people and both companies have provided me with temporary testing accounts in the past. Many people wouldn’t start talking price as the first factor because they aren’t cheap like me or always thinking about the return on investment. Yahoo Site Explorer is free so it is wins the price comparison! SEOmoz charges between $80 (up to 20 domains) and $230 (up to 125 domains) a month. If you sign up for a year you can save 20% of your membership cost. Based on my experiment with these 9 websites I found that SEOmoz cost less than Majestic. SEOmoz also has their own checkout process and credit card processing. Majestic charges based on how much data they have for each domain & how often you want it updated (1 week up to 1 year). The more data they have and the more updates you want, the more credits it will cost you. Each credit is one English pound (about $1.50) and they do offer bulk discounts up to 30% off. If I had wanted to see Google’s backlinks I would have needed 600 credits. Majestic is charging in English Pounds so you may have to pay a finance charge on American credit cards or VAT with European credit cards. If you are researching sites with less than 1,000 domains linking to them, then Majestic will probably be much cheaper. (ps Majestic currently uses Paypal for their checkout process). Below are the costs for 1 week updates of the nine urls I tested. Majestic SEO had more than 600% data of live backlinks for the nine websites I tested when compared to SEOMoz. Your exact mileage will vary but I expect 95% of the time Majestic SEO will have more data than SEOmoz Linkscape. I am sure Yahoo Site Explorer has more data than both Majestic and Linkscape. Unfortunately Yahoo’s display limitation of 1,000 backlinks prevents them from ever winning in a size contest unless you are looking at websites with less than 1,000 links. Majestic SEO captures and retains data on deleted links and redirected links. I couldn’t find this data in Linkscape. Since some people don’t care about deleted links and links that don’t boost search engine rankings I did not include that data in determining the size of the dataset. I also noticed that a significant amount of the backlinks Majestic SEO reports that SEOMoz Linkscape did not report were from scraper websites and other very low quality websites. This made me feel slightly less impressed with Majestic’s huge size advantage but still very impressed. It is hard to judge the quality of data especially when there are tens of thousands of links to compare. To help make this decision I decided to look at the top 5 backlinks from each source. SEOMoz Linkscape and Majestic SEO make this easy to find. For Yahoo I manually pulled out some backlinks from the first page of results. I then compared the pagerank, number of other links, and my gut feeling about the quality of each backlink. In my opinion SEOMoz and Majestic tie for quality of backlinks. Neither of them are perfect but both of them are much better than what is publicly available from the search engines. 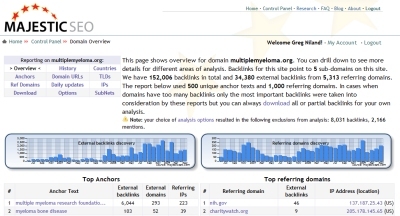 Looking at the top backlinks for MultipleMyeloma.org, SEOMoz ranks the CharityWatch.org backlink at #8 but ranks Zentrickster at #1 which I feel is a questionable call coming from them. Majestic ranked most sites very well but they had a handful of false positive backlinks which is probably related to the timeliness issue (keep reading for more about this). The issue of whose data quality is better could easily be debated with many, many good points for both Majestic SEO and SEOMoz’s Linkscape. Since they are both more than good enough and definitely better than what the search engines publicly provide I am calling it a tie and gonna move on. Yahoo wins hands down. They update their search index everyday and have way more crawling power than either Linkscape or Majestic. I’m not sure exactly how often Site Explorer is updated but it seems more current than Majestic and Linkscape. If you want to see the first sign of a backlink being discovered then use Yahoo. If you don’t mind waiting up to a few weeks for a new backlink to be discovered then use Linkscape or Majestic (which is what I do). A common issue with both Majestic and Linkscape is that sometimes they will report false positives because they haven’t revisited the page so their link reports could be slightly out of date. This seems to mostly impact websites that constantly add and remove backlinks on a daily basis (like the front page of digg.com). From my point of view this is not a big issue since most of the time you are looking for permanent links. There are not many reasons to need real time link intelligence. Also I think this will become less of an issue for both companies as they continue to expand their crawling resources and their recrawl rate improves. In case you are wondering about the report processing time – it is fast regardless who you use. Yahoo immediately returns data when you request it. Linkscape and Majestic take literally just a few seconds to retrieve the report for any domain you request. The best data is useless if it is not east to access and understand. Yahoo shows little data so it is easy to have good usability. Linkscape comes in second place because there is a tiny learning curve to understanding all the information they display and the options you have for sorting. Majestic is not terrible but it definitely deserves third place in the usability category. They provide so much information, options and countless ways to play around with the data that is honestly overwhelming. Imagine trying to drink from a firehose. I get the feeling a very smart programmer designed it to be as powerful as possible and forgot to ask for a designer to lend a guiding hand. This will probably get improved since they recently started making their website prettier. I don’t want to write an ebook about this so I am just gonna spout off a list of extra items to consider. 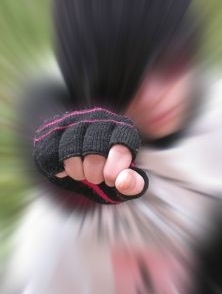 SEOMoz provides free archive access to old reports. Majestic SEO made me pay. If you use Majestic make sure to download all the data for archival purposes. You may have some problems recreating my backlink counts on Majestic SEO since I used some of their filters. Majestic is like a stick shift car – not as easy to use but if you want to drive a Ferrari you better learn to drive stick shift. 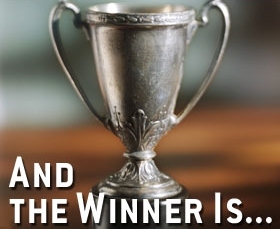 SEOMoz does one of the best jobs of analyzing links in the entire industry. Their MozRank and MozTrust are as good as you are going to find publicly available. Since Majestic SEO provides reporting on deleted and no longer existing backlinks you could use it to reverse engineer a drop in traffic, rankings or maybe even some penalties. SEOMoz includes a bunch of other tools and benefits for your monthly membership. Whenever I beta tested and found bugs both SEOMoz and Majestic were quick to fix them. I have never had a problem or heard of a customer service problem with either company. I have provided both Majestic SEO & SEOMoz Linkscape Team to preview this review so they could include their words of wisdom (and also make sure I didn’t totally misuse their tools). I’m happy to be equated to a Ferrari that needs a stick shift! In terms of price, we give all data on domains you control free of charge at the moment. What’s more, we provide more free stuff than Yahoo, including the ability to compare the back link history of up to five domains. This is very cool and I think unique. Does Yahoo has more data than majestic’s back link data? We are not so sure. We started crawling four years ago and we think we have more link data than Yahoo and we are catching up with Google. We see part of our business being at an enterprise level, with big players building applications on top of an Enterprise level Link API. This mass of data also affects out indexing updates (freshness) is indeed our greatest challenge at the moment. Expect an update very soon, but also know that we are working on this issue. The data we provide in our tools is almost always a contextually selected subset of the data in our index. We’re trying to provide only the most relevant, actionable, and up-to-date information to our users. This means that in each context, we are going to exclude some data we think isn’t adding extra value. Our focus since launch nine months ago has been providing the most important data to users. As you point out, we’re working hard to exclude scrapers and duplicate data, although we believe there is an overwhelming amount of these. Over the next six months we’ll take that expertise in quality and scale up. My personal preference is Majestic SEO. They provide more data including deleted backlinks and they are cheaper for less competitive industries. Since I am serious about making profit online I also use Linkscape since it does a much better job estimating link juice and trust. Linkscape is a much better bargain for highly competitive keywords with huge amounts of backlink data. I strongly encourage you to try both of these services. Using the data from Majestic & Linkscape I have boosted the rankings for several of my websites. The data even helped me find a website that I was able to get a banner ad on and now that website is a top referrer to one of my websites. I have made a good profit from both of these services. This is a no-brainer. How much money would you gain if your website climbed one spot in the rankings? If you can gain more than $100 a month then sign up for Majestic SEO and/or Linkscape. If you can’t make a profit with this data you may want to rethink your future in SEO.